Jared and Mikey Etzel, two sons of Beaux Freres winemaker and co-owner Mike Etzel, produce small lots of Pinot Noir. 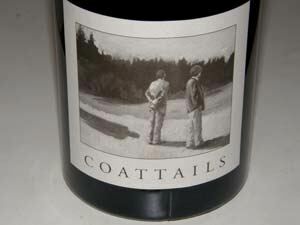 Both a Horsetail (early drinking) and Coattails (age worthy, expensive) Pinot Noir are released. The first vintage was 2007. Mikey Etzel previously worked in the vineyards at Willakenzie Estate Winery and is now the vineyard manager at Brick House Vineyards. Jared Etzel lives in St. Helena, CA and works for Denis Malbec who is the winemaking consultant to Kapcsandy, Blankiet and Capture wineries. Jared and his brothers are developing a very small project producing Cabernet Sauvignon from a vineyard on Mt. Veeder in Napa Valley. The first vintage will be 2010 and will be called "Lis Chu Vineyard By The Etzel Brothers." Both Mikey and Jared completed the Oregon State University Enology and Viticulture Program and have spent time in Europe. Youngest brother Nathan is in finishing a bachelor's degree in electrical engineering in Denmark. The wines are sold through a mailing list and the winery online store.